It is an irrefutable reality that India’s prime intelligence agency RAW is leading terrorist activities in Baluchistan by using the soil of Afghanistan, harbouring and financing terrorists and projecting them as freedom fighters. This covert support is going on since 2002 and several other foreign agencies have also been supplementing RAW’s efforts. RAW had created Mukti Bahini, a militant wing of Awami League in former East Pakistan in late 1960s and in 1971 established 59 training camps all along the border to train, equip and launch them to sever eastern wing from West Pakistan. After accomplishing its mission, in 1973 RAW was assigned the task of subverting Sindh with the help of Sindhi nationalist parties. In conjunction with KGB and KHAD, RAW fully supported Baloch insurgency from 1973 to 1978; and again destabilised Pakistan in 1980s by supporting Al-Zulfiqar, a terrorist wing of PPP. After the creation of MQM in 1984, RAW established links with the new party leadership and is still guiding and assisting it. Over one million weapons have been inducted in port city by RAW and other agencies as well as NATO to make the economic hub centre restive. Startling disclosures have been made by two recently arrested MQM terrorists Junaid and Tahir Lamba who revealed that RAW has been imparting training to MQM workers since 1996 at Dheradun to destabilize Karachi. RAW is arming, training and funding banned terrorist groups Baloch Liberation Army (BLA), Baloch Republican Army (BRA), Baloch Liberation Front (BLF) and Baluchistan Lashkar headed by runaway Baloch rebel leaders. Pattern is similar to its support to Mukti Bahini in 1971. RAW established 9 training camps along Afghan-Pakistan border in 2003 to train Baloch dissidents. Later, in league with CIA, MI-6 and Afghan NDS, it set up 60 training camps in interior Baluchistan. Shamsi airbase in Baluchistan (100 miles away from Iran’s eastern border and same distance from Afghanistan’s southern border) was also used by CIA to foment insurgency and to assist Jundollah group. Besides sabotage and subversion, Indo-US-Western propaganda machinery has been eulogising the heroics of the Baloch insurgents by projecting them as seekers of their socio-politico-economic rights. Atrocities of insurgents against non-Baloch settlers in Baluchistan, forcing over 100,000 to migrate, blatant target killings of pro-Pakistan Baloch and government officials, teachers/professors, Hazaras, kidnapping for ransom, blowing up gas pipelines, electric pylons/grids, railway lines, attacking trains, security forces, challenging the writ of the state, seeking foreign support to break up Pakistan, all these undesirable acts were looked the other way. No objections were raised by local and foreign media when exiled Baloch leaders sought intervention by India, or the US or NATO or the UN to help them liberate Baluchistan. Conversely, counter actions of the law enforcement agencies (LEA) to safeguard territorial integrity of the state are projected as violation of human rights. The government is also described in poor light having robbed the resources of the province. a. Successive governments have kept Baluchistan deprived and backward and are stealing Baloch mineral resources. b. Punjab Army is anti-Baloch and has turned Baluchistan into a colony. c. Army is carrying out genocide of Baloch. d. Over 18000 Baloch men and women have gone missing. e. Agencies and FC are behind forced disappearances of Baloch and kill and dump policy to suppress Baloch people. CIA, MI-6, RAW, Mossad, Afghan NDS in unison have unremittingly utilized all sorts of covert and overt methods to foment unrest in Baluchistan. Grievances of the Baloch and the issue of missing persons/enforced disappearances and ‘kill and dump policy’ have been relentlessly played up for many years and in this several Pak TV channels, journalists, HRW and human rights activists have been promoting the foreign agenda to discredit intelligence agencies and Frontier Corps Baluchistan. Mama Qadeer who also supports the separatist agenda was lionised by certain TV channels particularly Geo. His long march from Quetta to Karachi and Islamabad from October 2013 till February 2014 in protest of non-recovery of missing persons was given wide publicity. There are hundreds of foreign funded NGOs promoting the cause of Baloch separatists and pursuing foreign agendas. Grievances of the Baloch and the issue of missing persons/enforced disappearances and ‘kill and dump policy’ have been relentlessly played up for many years and in this several Pak TV channels, journalists, HRW and human rights activists have been promoting the foreign agenda to discredit intelligence agencies and Frontier Corps Balochistan. Mama Qadeer who also supports the separatist agenda was lionised by certain TV channels particularly Geo. His long march from Quetta to Karachi and Islamabad from October 2013 till February 2014 in protest of non-recovery of missing persons was given wide publicity. There are hundreds of foreign funded NGOs promoting the cause of Baloch separatists and pursuing foreign agendas. RAW keeps changing tactics in rapid succession. A year back it hyphenated Pakistan with ISIS/Jehadis through ‘guided’ and misleading interviews. Uploading of a notorious terrorist Allah Nazar’s interview on a RAW-managed Indian propaganda website on ‘Online’ further confirmed the information at hand that India has been training, financing, arming and projecting terrorists to destabilize Pakistan and Afghanistan”. The thrust of the interview revolved around unproven allegations against Pakistan’s LEAs, intelligence agencies and Pak-China relations. Purpose behind it was to subtly gather the sympathies of civil society besides confusing things as the website introduced Allah Nazar as a so-called freedom movement leader fighting against Jehadi elements and ISIS. Allah Nazar is a terrorist hailing from Awaran, Baluchistan as established after thorough perusal and verification of record of his activities spread over a period of many years. Pak agencies have gathered sufficient evidence which suggests that this person has been enjoying direct support of RAW for committing heinous crimes against humanity viz. killing of men, women and children, attacks on women university students and members of LEAs and blowing up of electric pylons as well as gas pipelines. These insane and murderous acts are being projected as deeds of a liberation movement. It may be recalled that Allah Nazar and his group BLF continued to harass local population in Awaran, Punjgur and Kech districts for a number of years. 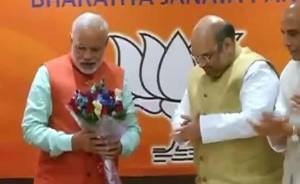 However, he fled from the area on arrival of forces during earthquake relief activities in September 2013. People of the area felt immensely relieved after the arrival of forces and on their large scale relief efforts. Since then, Allah Nazar and his likeminded accomplices have fled to other areas known only to Indian RAW from where they are carrying out terrorist activities. Chinese working in Gwadar and other parts of Baluchistan have also been targeted by Baloch terrorists. Besides Allah Nazar, other Baloch rebel leaders living a luxurious life in exile since 2006 are Brahamdagh Bugti and Mehran Marri in Geneva, Hyrbyar Marri and Mir Suleman Khan Daud in London, Dr Khaliq Baloch in Washington. Most sordid aspect of these anti-Pakistani activities is that they are not only Pakistan-specific but they also target Chinese interests. India is using terrorist elements in Baluchistan to threaten Chinese interests in the development of China-Pak Economic Corridor. The ink on the historic agreement had barely dried up when western media and foreign paid NGOs in Pakistan sprang into action and started drumming up Baluchistan insurgency. Sabeen Mahmud heading 2F NGO in Karachi hosted a seminar focussing on disappearance of Baloch nationalists and to demonise ISI/FC. This topic was initially scheduled in LUMS Lahore, but was cancelled on the intervention of Punjab government. Unfortunate Sabeen was purposely murdered by the schemers on the same day when she was driving home to earn sympathies of the public and to make ISI a suspect. The next event which coincided with China President’s visit was the interview of Brahamdagh Bugti from Geneva which was given wide publicity by western media. His focal point was his fears about China-Pakistan corridor, which in his jaundiced view was aimed at colonizing Baluchistan. He urged his followers to resist. Late Nawab Akbar Bugti had also started the insurgency in 2004 on the plea that development of Gwadar would be against the interests of the Baloch. Rights activists also stepped up their propaganda accusing security forces of carrying out extra judicial killings of separatists in Baluchistan. Hussain Haqqani wrote an insidious article in Wall Street Journal in this timeframe, while Tariq Fateh sent anti-Pakistan tweets from Delhi. Activation of Baluchistan card indicates the nervousness of detractors of Pakistan who know that the envisaged corridor would drown all the sinister plans hatched by them to denuclearise and balkanise Pakistan. It must not be forgotten that only a third of population of Baluchistan is Balochi speaking which include Brahvis as well. More numbers of Baloch live in southern Punjab and Sindh who are educated, patriotic and well integrated with rest of people of Pakistan. Great numbers of Baloch youth are joining armed forces and paramilitary forces and trend to get educated is on the rise – thanks to dedicated efforts of the Army. Dr Malick’s regime helped by the federal government is working hard to alleviate the grievances of the Baloch and to bring back the misled Baloch leaders. Passage of 18th Amendment allowing greater autonomy to provinces, allocation of extraordinary heavy development budget and establishment of nationalist government in Baluchistan has left the insurgents with no ground to grieve and seek independence. Baloch insurgency is made up of handful of insurgent groups, mostly belonging to Bugti, Marri and Mengal tribes and except for Allah Nazar, all other rebel leaders are residing abroad enjoying the hospitality of their patrons. Insurgents represent only a few districts and they have no political party and are highly unpopular. They are disgruntled, exhausted, disenchanted and involved in infighting. Their patrons are vexed and vainly keep counseling them to unite for their lost cause. Pakistan of today is alive to all these threats and challenges and the sitting government, headed by Prime Minister Mian Nawaz Sharif, the entire political leadership and the army under the command of COAS Gen Raheel Sharif and other services’ chiefs are unanimous and in complete agreement with one another on the policy of ‘no surrender to such nefarious activities’. Establishment of Special Security Division to ensure security of foreign and local workers employed along the corridor is a wise step and will help in frustrating the baleful designs of anti-state elements. into the island kingdom of Bahrain. The ruling family there, long a close Saudi ally, appealed for assistance in dealing with increasingly large protests. Iran soon rattled its own sabers. Iranian parliamentarian Ruhollah Hosseinian urged the Islamic Republic to put its military forces on high alert, reported the website for Press TV, the state-run English-language news agency. “I believe that the Iranian government should not be reluctant to prepare the country’s military forces at a time that Saudi Arabia has dispatched its troops to Bahrain,” he was quoted as saying. The intensified wrangling across the Persian—or, as the Saudis insist, the Arabian—Gulf has strained relations between the U.S. and important Arab allies, helped to push oil prices into triple digits and tempered U.S. support for some of the popular democracy movements in the Arab world. Indeed, the first casualty of the Gulf showdown has been two of the liveliest democracy movements in countries right on the fault line, Bahrain and the turbulent frontier state of Yemen. But many worry that the toll could wind up much worse if tensions continue to ratchet upward. They see a heightened possibility of actual military conflict in the Gulf, where one-fifth of the world’s oil supplies traverse the shipping lanes between Saudi Arabia and Iran. Growing hostility between the two countries could make it more difficult for the U.S. to exit smoothly from Iraq this year, as planned. And, perhaps most dire, it could exacerbate what many fear is a looming nuclear arms race in the region. Iran has long pursued a nuclear program that it insists is solely for the peaceful purpose of generating power, but which the U.S. and Saudi Arabia believe is really aimed at producing a nuclear weapon. At a recent security conference, Prince Turki al Faisal, a former head of the Saudi intelligence service and ambassador to the U.K. and the U.S., pointedly suggested that if Iran were to develop a weapon, Saudi Arabia might well feel pressure to develop one of its own. The Saudis currently rely on the U.S. nuclear umbrella and on antimissile defense systems deployed throughout the Persian Gulf region. The defense systems are intended to intercept Iranian ballistic missiles that could be used to deliver nuclear warheads. Yet even Saudis who virulently hate Iran have a hard time believing that the Islamic Republic would launch a nuclear attack against the birthplace of their prophet and their religion. 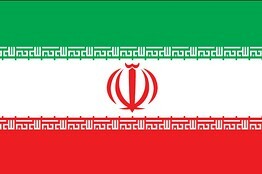 The Iranian leadership says it has renounced the use of nuclear weapons. How a string of hopeful popular protests has brought about a showdown of regional superpowers is a tale as convoluted as the alliances and history of the region. It shows how easily the old Middle East, marked by sectarian divides and ingrained rivalries, can re-emerge and stop change in its tracks. 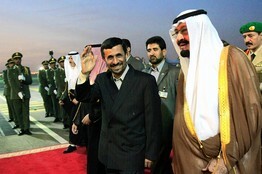 There has long been bad blood between the Saudis and Iran. 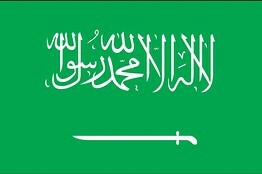 Saudi Arabia is a Sunni Muslim kingdom of ethnic Arabs, Iran a Shiite Islamic republic populated by ethnic Persians. Shiites first broke with Sunnis over the line of succession after the death of the Prophet Mohammed in the year 632; Sunnis have regarded them as a heretical sect ever since. Arabs and Persians, along with many others, have vied for the land and resources of the Middle East for almost as long. These days, geopolitics also plays a role. The two sides have assembled loosely allied camps. Iran holds in its sway Syria and the militant Arab groups Hezbollah in Lebanon and Hamas in the Palestinian territories; in the Saudi sphere are the Sunni Muslim-led Gulf monarchies, Egypt, Morocco and the other main Palestinian faction, Fatah. The Saudi camp is pro-Western and leans toward tolerating the state of Israel. The Iranian grouping thrives on its reputation in the region as a scrappy “resistance” camp, defiantly opposed to the West and Israel. For decades, the two sides have carried out a complicated game of moves and countermoves. With few exceptions, both prefer to work through proxy politicians and covertly funded militias, as they famously did during the long Lebanese civil war in the late 1970s and 1980s, when Iran helped to hatch Hezbollah among the Shiites while the Saudis backed Sunni militias. But the maneuvering extends far beyond the well-worn battleground of Lebanon. Two years ago, the Saudis discovered Iranian efforts to spread Shiite doctrine in Morocco and to use some mosques in the country as a base for similar efforts in sub-Saharan Africa. After Saudi emissaries delivered this information to King Mohammed VI, Morocco angrily severed diplomatic relations with Iran, according to Saudi officials and cables obtained by the organization WikiLeaks. As far away as Indonesia, the world’s most populous Muslim country, the Saudis have watched warily as Iranian clerics have expanded their activities—and they have responded with large-scale religious programs of their own there. Iran’s Supreme Leader Ayatollah Ali Khamenei (above, in 2008) has recently compared the region’s protests to Iran’s 1979 revolution. In Riyadh, Saudi officials watched with alarm. They became furious when the Obama administration betrayed, to Saudi thinking, a longtime ally in Mr. Mubarak and urged him to step down in the face of the street demonstrations. The Egyptian leader represented a key bulwark in what Riyadh perceives as a great Sunni wall standing against an expansionist Iran. One part of that barrier had already crumbled in 2003 when the U.S. invasion of Iraq toppled Saddam Hussein. Losing Mr. Mubarak means that the Saudis now see themselves as the last Sunni giant left in the region. 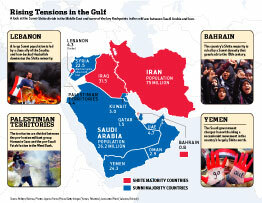 The Saudis were further agitated when the protests crept closer to their own borders. In Yemen, on their southern flank, young protesters were suddenly rallying thousands, and then tens of thousands, of their fellow citizens to demand the ouster of the regime, led by President Ali Abdullah Saleh and his family for 43 years. Meanwhile, across a narrow expanse of water on Saudi Arabia’s northeast border, protesters in Bahrain rallied in the hundreds of thousands around a central roundabout in Manama. Most Bahraini demonstrators were Shiites with a long list of grievances over widespread economic and political discrimination. But some Sunnis also participated, demanding more say in a government dominated by the Al-Khalifa family since the 18th century. Protesters deny that their goals had anything to do with gaining sectarian advantage. Independent observers, including the U.S. government, saw no sign that the protests were anything but homegrown movements arising from local problems. During a visit to Bahrain, Secretary of Defense Robert Gates urged the government to adopt genuine political and social reform. But to the Saudis, the rising disorder on their borders fit a pattern of Iranian meddling. A year earlier, they were convinced that Iran was stoking a rebellion in Yemen’s north among a Shiite-dominated rebel group known as the Houthis. Few outside observers saw extensive ties between Iran and the Houthis. But the Saudis nonetheless viewed the nationwide Yemeni protests in that context. 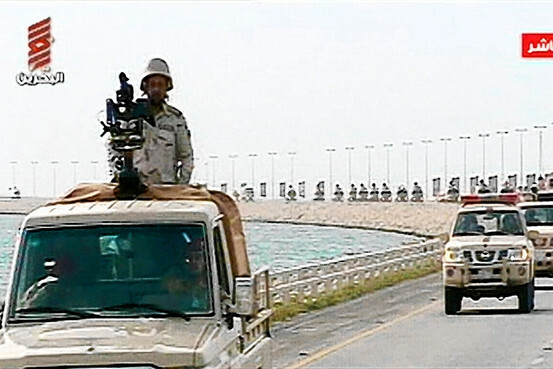 Saudi Arabian troops cross the causeway leading to Bahrain on March 14, above. 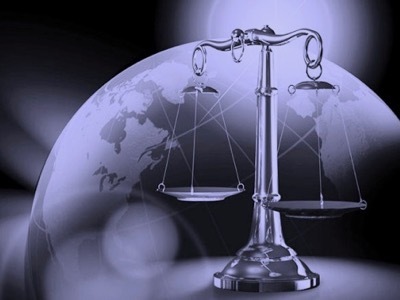 The ruling family in Bahrain had appealed for assistance in dealing with protests. In Bahrain, where many Shiites openly nurture cultural and religious ties to Iran, the Saudis saw the case as even more open-and-shut. To their ears, these suspicions were confirmed when many Bahraini protesters moved beyond demands for greater political and economic participation and began demanding a constitutional monarchy or even the outright ouster of the Al-Khalifa family. Many protesters saw these as reasonable responses to years of empty promises to give the majority Shiites a real share of power—and to the vicious government crackdown that had killed seven demonstrators to that point. But to the Saudis, not to mention Bahrain’s ruling family, even the occasional appearance of posters of Lebanese Hezbollah leader Hassan Nasrallah amid crowds of Shiite protesters pumping their fists and chanting demands for regime change was too much. They saw how Iran’s influence has grown in Shiite-majority Iraq, along their northern border, and they were not prepared to let that happen again. As for the U.S., the Saudis saw calls for reform as another in a string of disappointments and outright betrayals. Back in 2002, the U.S. had declined to get behind an offer from King Abdullah (then Crown Prince) to rally widespread Arab recognition for Israel in exchange for Israel’s acceptance of borders that existed before the 1967 Six Day War—a potentially historic deal, as far as the Saudis were concerned. And earlier this year, President Obama declined a personal appeal from the king to withhold the U.S. veto at the United Nations from a resolution condemning continued Israeli settlement building in Jerusalem and the West Bank. The Saudis believe that solving the issue of Palestinian statehood will deny Iran a key pillar in its regional expansionist strategy—and thus bring a win for the forces of Sunni moderation that Riyadh wants to lead. Iran, too, was starting to see a compelling case for action as one Western-backed regime after another appeared to be on the ropes. It ramped up its rhetoric and began using state media and the regional Arab-language satellite channels it supports to depict the pro-democracy uprisings as latter-day manifestations of its own revolution in 1979. “Today the events in the North of Africa, Egypt, Tunisia and certain other countries have another sense for the Iranian nation.… This is the same as ‘Islamic Awakening,’ which is the result of the victory of the big revolution of the Iranian nation,” said Ayatollah Ali Khamenei. Iran also broadcast speeches by Hezbollah’s leader into Bahrain, cheering the protesters on. Bahraini officials say that Iran went further, providing money and even some weapons to some of the more extreme opposition members. Protest leaders vehemently deny any operational or political links to Iran, and foreign diplomats in Bahrain say that they have seen little evidence of it. March 14 was the critical turning point. At the invitation of Bahrain, Saudi armed vehicles and tanks poured across the causeway that separates the two countries. They came representing a special contingent under the aegis of the Gulf Cooperation Council, a league of Sunni-led Gulf states, but the Saudis were the major driver. The Saudis publicly announced that 1,000 troops had entered Bahrain, but privately they concede that the actual number is considerably higher. If both Iran and Saudi Arabia see themselves responding to external threats and opportunities, some analysts, diplomats and democracy advocates see a more complicated picture. They say that the ramping up of regional tensions has another source: fear of democracy itself. Long before protests ousted rulers in the Arab world, Iran battled massive street protests of its own for more than two years. It managed to control them, and their calls for more representative government or outright regime change, with massive, often deadly, force. Yet even as the government spun the Arab protests as Iranian inspired, Iran’s Green Revolution opposition movement managed to use them to boost their own fortunes, staging several of their best-attended rallies in more than a year. Saudi Arabia has kept a wary eye on its own population of Shiites, who live in the oil-rich Eastern Province directly across the water from Bahrain. Despite a small but energetic activist community, Saudi Arabia has largely avoided protests during the Arab Spring, something that the leadership credits to the popularity and conciliatory efforts of King Abdullah. But there were a smattering of small protests and a few clashes with security services in the Eastern Province. The regional troubles have come at a tricky moment domestically for Saudi Arabia. King Abdullah, thought to be 86 years old, was hospitalized in New York, receiving treatment for a back injury, when the Arab protests began. The Crown Prince, Sultan bin Abdul Aziz, is only slightly younger and is already thought to be too infirm to become king. Third in line, Prince Nayaf bin Abdul Aziz, is around 76 years old. Viewing any move toward more democracy at home—at least on anyone’s terms but their own—as a threat to their regimes, the regional superpowers have changed the discussion, observers say. The same goes, they say, for the Bahraini government. “The problem is a political one, but sectarianism is a winning card for them,” says Jasim Husain, a senior member of the Wefaq Shiite opposition party in Bahrain. Since March 14, the regional cold war has escalated. Kuwait expelled several Iranian diplomats after it discovered and dismantled, it says, an Iranian spy cell that was casing critical infrastructure and U.S. military installations. Iran and Saudi Arabia are, uncharacteristically and to some observers alarmingly, tossing direct threats at each other across the Gulf. The Saudis, who recently negotiated a $60 billion arms deal with the U.S. (the largest in American history), say that later this year they will increase the size of their armed forces and National Guard. And recently the U.S. has joined in warning Iran after a trip to the region by Defense Secretary Gates to patch up strained relations with Arab monarchies, especially Saudi Arabia. Minutes after meeting with King Abdullah, Mr. Gates told reporters that he had seen “evidence” of Iranian interference in Bahrain. That was followed by reports from U.S. officials that Iranian leaders were exploring ways to support Bahraini and Yemeni opposition parties, based on communications intercepted by U.S. spy agencies. Saudi officials say that despite the current friction in the U.S.-Saudi relationship, they won’t break out of the traditional security arrangement with Washington, which is based on the understanding that the kingdom works to stabilize global oil prices while the White House protects the ruling family’s dynasty. Washington has pulled back from blanket support for democracy efforts in the region. That has bruised America’s credibility on democracy and reform, but it has helped to shore up the relationship with Riyadh. The deployment into Bahrain was also the beginning of what Saudi officials describe as their efforts to directly parry Iran. While Saudi troops guard critical oil and security facilities in their neighbor’s land, the Bahraini government has launched a sweeping and often brutal crackdown on demonstrators. It forced out the editor of the country’s only independent newspaper. More than 400 demonstrators have been arrested without charges, many in violent night raids on Shiite villages. Four have died in custody, according to human-rights groups. Three members of the national soccer team, all Shiites, have also been arrested. As many as 1,000 demonstrators who missed work during the protests have been fired from state companies. In Shiite villages such as Saar, where a 14-year-old boy was killed by police and a 56-year-old man disappeared overnight and showed up dead the next morning, protests have continued sporadically. But in the financial district and areas where Sunni Muslims predominate, the demonstrations have ended. In Yemen, the Saudis, also working under a Gulf Cooperation Council umbrella, have taken control of the political negotiations to transfer power out of the hands of President Ali Abdullah Saleh, according to two Saudi officials. King Mohammed VI is the ruler of Morocco. An earlier version of this article incorrectly stated that the ruler was Hassan II. —Nada Raad and Farnaz Fassihi contributed to this article. We have Zero Tolerance for Sectarian Terrorism. Let there be no doubt. These Jihadis are turning on than that fed them during the Soviet Afghan War. Taliban are no different than any other Dogs of War, at the pay of any Master, who sponsors them. Iran and Saudi Arabia have stabbed Pakistan on the back. They have taken undue advantage of our love and friendship and used our soil to fight their proxy battles. These two nations, whom Pakistanis have served to educate and taught them basic health care skills, have returned our favours by making our nation their killing field. They have brainwashed our people through their own tarnished brand of faith and used them through financial incentives, to fight their sectarian wars. These Jihadis need to be arrested en masse in all cities of Pakistan and Deprogrammed by Islamic Scholars from all Fiqh of Islam. 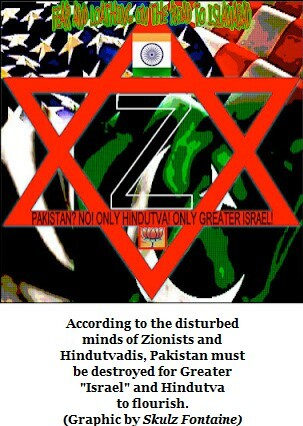 Without a massive deprogramming process, they will continue to create turmoil in Pakistan. Their heinous behavior involves attacking most weak and vulnerable. These cowards have chosen the defenceless, innocent, and peaceful Hazawal Pakistanis, who cannot fight back. Quetta is not a playground for the Un-Islamic “Jihadi” Fanatics, funded by Saudis and Iran. Pakistani blood is not cheap it is precious. All Pakistanis need to close ranks and fight the Takfiri Jihadis. They do not represent Islam and its Core Values. Islam does NOT teach killing innocent men, women, and children, whether Muslims or Non-Muslim, or Atheists. Islam is a Deen, which protects the sanctity of human life and protects minorities. The communist kafirs of the Evil Soviet Empire have been defeated. US forces is exiting Afghanistan in 2014. Takfiris should be offered a choice either get educated in a state registered Darul Uloom or be mainstreamed in an Islamic University. But, they should never be left by alone to practice their heinous ideology. Pakistan is not a battlefield for hire, for Iran versus Saudi Arabs Un-Islamic Sectarian Wars.